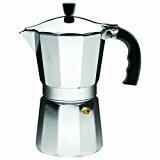 Best Stovetop Espresso Maker Reviews – For so many coffee-lovers, brewing your favourite caffeinated drink has a purpose that’s so far removed from the idea of mere utility and the role caffeine plays in our day. It’s a work of art that you want cultivate and experiment with; it’s the romantic notion of it all, which means from the crema pattern to the rich texture and colour, we want to achieve real, fresh and authentic coffee. So in our quest for authenticity, the stovetop presentation coffee maker or Moka Pot has found a special place in the hearts of many seeking to recreate the nostalgia of the traditional home-made Italian espresso. 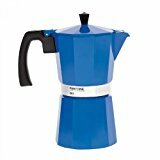 Made popular in Europe and Latin America, the stovetop method (AKA Moka Pot) of producing coffee, uses pressure to force hot water up from the base through the ground coffee into the top carafe. 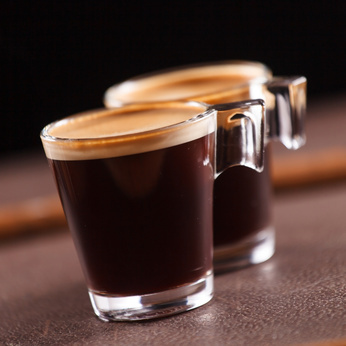 This method is loved for its heavy body and traditional espresso-style flavour. Authentic Feel – the stovetop method produces a rich, full-bodied taste that treats you to espresso made exactly – or as close (the case may be) as, it was intended. Quick & Easy – the stovetop function requires very little effort, just a case of back-to-basics; stove on so when the top is full of espresso and steam is coming out of the nozzle – it’s done! Affordable – the stovetop coffee makers are nothing if not affordable. Many great authentic Italian names that have been fine-crafting the art of coffee brewing for decades and all for under $20 – crazy right?! It’s clear to see why this Bialetti Stovetop Espresso Maker is a #1 Best Seller. Bialetti have become an iconic name with over 50 years of experience manufacturing coffee makers. This espresso maker certainly looks the part, with a stylishly polished aluminium design as well as with its own flair of originality. But it gets the job done too! Making 6 2-ounce cups of rich, authentic coffee in 4-5 minutes. And with all the tips of the trade from Bialetti, it’s simple and easy to make your own espresso the only way it’s supposed to be. 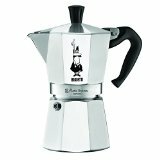 → Get the Bialetti Stovetop Espresso Maker on Amazon! This IMUSA stovetop espresso maker will definitely produce the goods – promising a rich, full-bodied flavour and would be a lovely addition on a tray for those special Sunday breakfast-in-bed mornings. It’s got a good capacity, perfect for when company is over and would also make a useful and affordable gift; perfect for any occasion. The only thing to really be cautious of is that while the plastic handle and knob add to its general aesthetic appeal as well as usefulness, it would seem that many have melted in the past. So be prepared! → Get the IMUSA Espresso Stovetop on Amazon! A reliable, authentic and extremely affordable solution to your coffee-craving needs! And it’s adaptable too, as it can be used with either gas or electric hobs. Producing results comparable with Gaggia and the like machines – and all for $14-ish, you’ve got a great little product that you can show off without the fuss and without the obscene price tag. 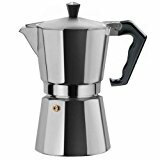 → Get the Primula Stovetop Espresso Maker on Amazon! A classically Italian designed stovetop coffee maker but with a twist! Manufactured with particular pantone flair – these Whitbread Wilkinson coffee makers certainly have a ‘je ne sais quoi’ element to them. Adaptable to electric or gas stovetops and promising to produce fresh, rich tasting espresso coffee in just 4 minutes, this little feature will perhaps never be considered a piece of luxury but I’m sure for some, it’ll be – in its own way, cherished indefinitely. → Get the Whitbread Wilkinson Coffee Maker on Amazon! And rolling out the big guns! This Cuisinox Roma Espresso Maker undoubtedly comes with an air of intimidation against its rivals. Sporting a heavy gauge stainless steel frame, with induction base and no plastic parts, which could easily melt or burn on a gas cooker – this espresso maker is solid. Beautifully practical and functionally adaptable – coming complete with an extra gasket and reducer; in case you prefer your coffee somewhat thinner. But with a –more than slightly, heftier price tag, it’s up to you to decide, where quality ends and quantity begins.